Want to get rid of background noise in your Mic? Here’s how to reduce background noise on Mic Windows 10 without headset with noise cancelling microphone. Microphone background noise or microphone buzzing sound might be a very annoying and painful situation for you if you want to record anything very important with high-quality audio. Specially, if you record videos or audios using your Windows 10 laptop, you might have experienced lots of background noise in microphone during your video. Actually, the microphone’s default settings which come with Windows 10 operating system are not optimized for background noise reduction by the Microsoft which leads to background noise during filming a video or recording audio. And if you are getting background noise on Mic continuously, your video won’t be up to the mark as you are simply losing the quality of video with poor background noise. The only solution to get the best video with great output is by reducing background noise from microphone on Windows 10 laptop. We are pretty sure, most of the newbie Windows 10 users might be wondering how to reduce background noise on Mic Windows 10 without using headset with noise cancelling microphone or microphone background noise reduction software. Don’t worry, we are here to the rescue as our readers know that we share different tutorials which are specially focused on Windows 10 operating system and today we are going to tell you how to reduce microphone noise in Windows 10. 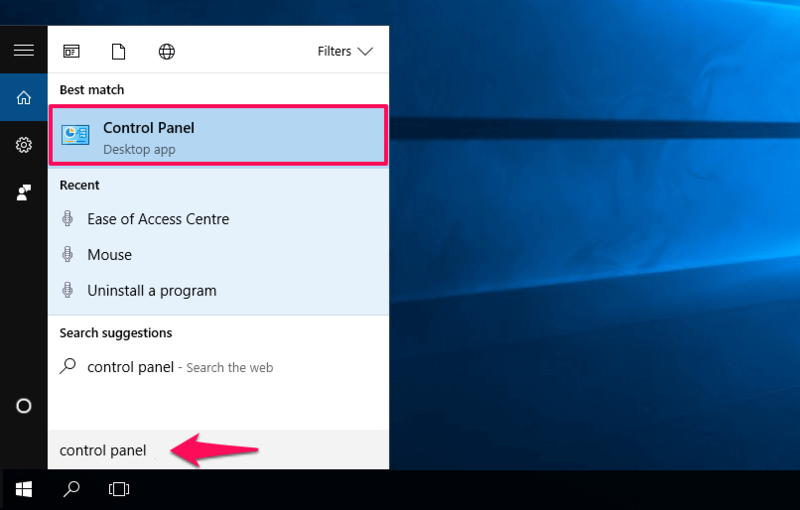 How to remove background noise from Mic Windows 10 and how to fix Windows 10 microphone buzzing sound are some of the widely searched terms over the internet, and that’s the main reason for us to bringing out this background noise cancelling tutorial. There are plenty of methods available on the internet to get rid of background noise in your microphone, but some of these methods work while some don’t. The method explained in this guide has already tested and will perfectly help you in removing background noise from Microphone on Windows 10. So, are you ready to know how to reduce background noise on Mic Windows 10? Here we go. Step (1): First of all, type control panel in the search box on the taskbar and then select Control Panel option from the search result. Or alternatively, you can press Windows + X keys together to open the Quick Access Menu, and then select Control Panel option. 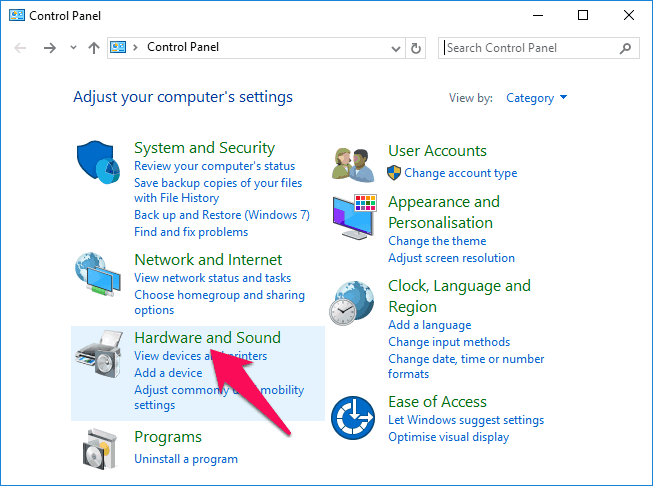 Step (2): Once the Control Panel is opened on your Windows 10 system, you have to click on the Hardware and Sound option. Step (3): On the Hardware and Sound window, select the Sound option. Step (4): Now on the Sound dialog box, go to Recording tab. Here, you will see all the different recording devices which you are using on your computer. Simply, right click on the microphone which you are using to record video or audio and then click on the Properties option. Step (5): On the Microphone Properties dialog box, go to the Level tab. Here, you need to check and see that Microphone level is 100 or not. It should be 100 which is the maximum. In case, you are getting low sound while recording then you can increase the sound by moving the slider. You can set the Microphone Boost slider to +10.0 dB or more. Step (6): Once done, now go to the Enhancements tab. Here, you have to select the Immediate Mode and then select Acoustic Echo Cancellation and Noise Suppression option. Step (7): After selecting these options, you can click on OK option to finally save the changes. Congratulations! You have successfully reduced background noise on Mic Windows 10 system. After making all these changes, you can start recording video or audio and you will see that you are getting less background noise in Mic during your video. These are some of the very important steps which make to our guide of how to get rid of background noise in your Microphone. If you have followed all these steps carefully, you should be able to reduce background noise on Mic easily without any issues. Don’t go for a low-quality microphone. If you are having good budget then we suggest you to go for a high-quality microphone or headset with noise cancelling microphone (background noise cancelling microphone or noise reduction microphone headset) as better the microphone is better is the sound quality. Air Filter and Pop Filter are of great help as they can help you in minimizing background noise. So if you want to get rid of background noise in your Mic, try out with Pop Filter. Make sure that your distance from Mic is no more than a foot. Check your optimal distance from Mic for best sound results. Using Reflection Shields will also help you in minimizing other sounds. We hope you found some amazing help regarding Windows 10 microphone background noise reduction and to get rid of microphone buzzing sound. If you liked this tutorial how to reduce background noise on Mic Windows 10 then feel free to share with your friends on social media such as Facebook, Google Plus, and Twitter etc. Please, let us know using the comment section below if you know any better microphone background noise reduction techniques for Windows 10 laptops. Thanks for the great sharing man. This will help me to create more noise-free video tutorial for my YouTube channel.